Discover how to write great resume profiles that grab the attention of employers and pull them deeper into your resume, compelling them to read further. The professional profile is usually the first section employers look at when sorting through resumes. Employers will normally only glance at your resume for a few seconds before deciding whether you might be suitable for a job, and whether it is worth spending the time required to review your resume more closely. A great profile will quickly tell employers you are professional and well qualified for the job they need to fill. It will pique their interest and compel them to read further. A poorly written profile, on the other hand, will not tell employers enough about your ability to do the job they need to fill. Many employers will not read beyond a weak profile; they will simply put that resume in the "no" pile and move on to the next one. Do I Need a Profile? You need to include either a job objective or a profile on your resume. You only need one or the other, not both. Objectives are falling out of fashion, and they are not as effective as profiles when it comes to quickly showing the employer the experience and expertise you can bring to a job. Profiles, in my opinion, are stronger than job objectives. Some resume "experts" will tell you that resume profiles are unnecessary or passé, and you should omit them completely. I suspect the people who say things like that have never actually spent any time sorting through a huge pile of resumes. A great profile instantly summarizes your qualifications for a specific job. It helps the employer laser-focus on what you have to offer the company and read your resume more quickly and intelligently. It is much more difficult to quickly focus when reading a resume that does not have a profile. What, Exactly is a Professional Profile? 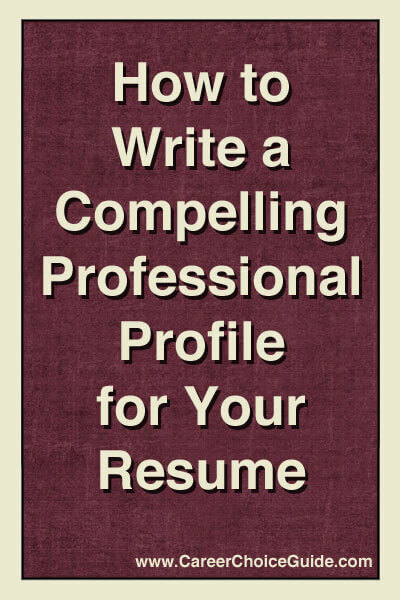 Your professional profile should be two or three sentences long. 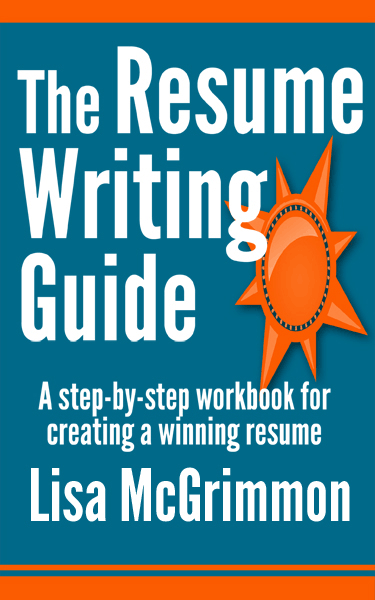 It will summarize your most marketable skills, qualifications and accomplishments and indicate the type of work you are currently seeking. When deciding what to include in your profile, ask yourself, "If I could only tell an employer two or three things about myself in order to convince him or her to hire me, what would I say?" Your answer to that question should tell you what to put in this section of your resume. Remember, the employer will use these two or three sentences to decide if he or she is going to read further on in your resume, so you must use your profile to quickly convince the employer you are a good match for the job. Keep in mind, it is crucial to summarize the skills and accomplishments that will be most important to an employer who is hiring for the specific position you are seeking. That means, if you are looking for more than one type of job, you will have more than one resume, and your profile will change depending on the requirements of each job. Here are a few sample profiles to give you some ideas about how this section of a resume is typically written and what you might include on your own resume. Administrative Professional with over five years of experience in the non-profit sector. Able to prioritize and manage conflicting demands. Exceptional technical skills including proficiency with Word, Excel and PowerPoint. Customer Service Manager with seven years of progressive professional experience. Results oriented with a proven ability to improve customer retention, and increase team productivity. Bilingual Events Coordinator with exceptional project management skills. Over ten years of experience working with volunteers, diverse teams and community leaders. Strong leadership skills with the ability to build the trust of others with integrity and consistently meet and exceed targeted results. 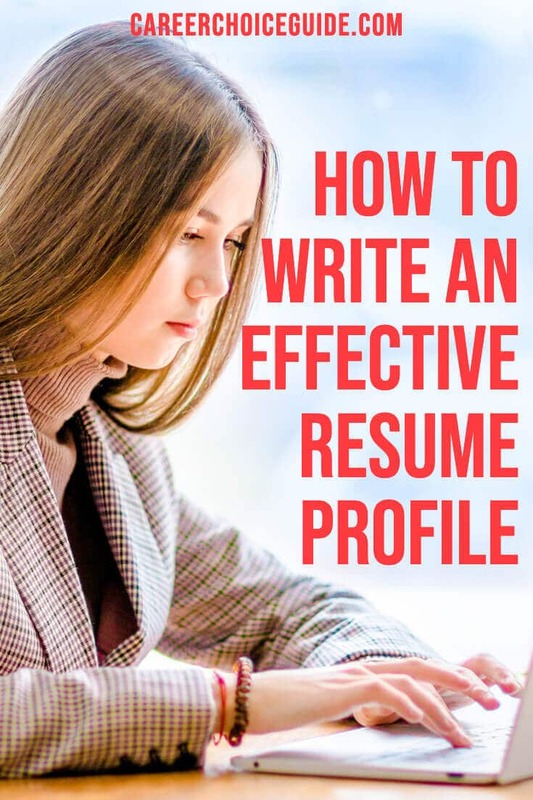 Resume profiles are a little more complex and take a little more time to write than simple job objectives, but they also make a stronger, more professional statement than objectives. A great profile will quickly highlight your most marketable skills as they relate to a specific job, and it will encourage the employer to continue reading on to the next sections of your resume. It is well worth the time to develop effective resume profiles for each type of job that you are seeking.